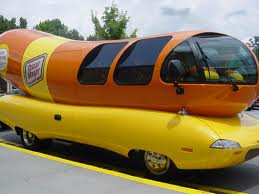 I was grocery shopping with my daughter today and we pulled up to Fred Meyer (grocery store) and the Oscar Meyer Wienermobile was parked in front. I've never actually seen it before only on TV. My daughter just said Wow, the funniest part was it was 2 young girls driving it, they stood out front and gave away wiener whistles and stickers for the kids and coupons for the adults. I noticed a small dent in the front, I wonder how much trouble you get in if you crash the Wienermobile?